We don't know about you, but we've finally hit a bit of a cold snap here in Amsterdam. It has been such a blistering summer that we've been avoiding our kitchens more fervently than last week's Tinder date. Finally, however, it seems that nesting season is upon us. & whether you'll be hunkering down alone, with a partner or, like Stephanie, with a new baby, a few homemade treats are never remiss. Though it's no longer a steam bath, we still may not be ready for full-fledged day-long kitchen projects. One step at a time, right? 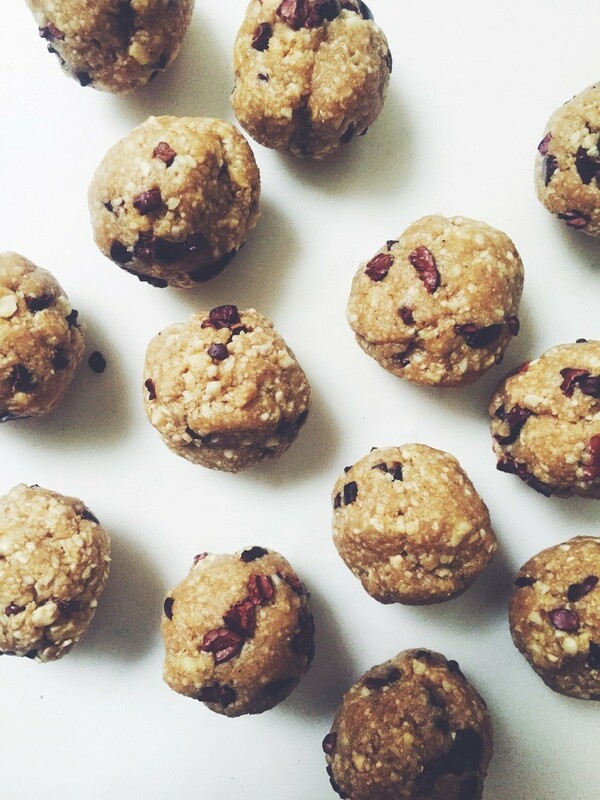 So, instead, we're opting for these raw cookie dough bites. We can't stop making them, & we really can't stop eating them. In a food processor, pulse together cashews, oats, cinnamon, and salt. Be careful not to over-pulse, as you do not want to create cashew butter. Add maple syrup and vanilla extract and pulse until dough forms a ball. Fold in cacao nibs. Divide dough into 12-15 chunks, depending on how large you make them. Roll them between your palms to create nice balls. Place onto a plate covered in parchment paper. Refrigerate until ready to eat.